SMPTE.au’s monthly technology evening for August, was a joint SMPTE-members plus open-to-industry event. It was presented by Stuart Monksfield’s business Mojo Media Solutions, and hosted by Soundfirm, in their theatrette at Fox Studios. The unit has won various industry awards over the last year or so. In January 2011, following testing at IRT (Institut fuer Rundfunktechnik, Munich), the EBU praised the PRM-4200 saying “The measurement results were the closest ever measured to almost fulfil the EBU Tech 3320 v2 specification for Grade 1 monitors”. More recently it was awarded the 2011 HPA Award for Engineering Excellence. On hand from Dolby Labs to demonstrate and discuss the product, were Chris Combs and Michael Reeves of Dolby US. As usual, this SMPTE Australia monthly technology evening, drew a diverse and representative audience, this time with over twenty attendees, with backgrounds covering broadcast equipment sales, station engineering, equipment manufacturing, film post production, audio post, engineering support and outside broadcast. Why was this evening and what it represented of such great importance to our industry? When Sony ceased manufacturing their last Grade 1 CRT precision video monitors almost a decade ago, the Industry was left with no credible source for purchasing an objectively calibrated and consistent picture assessment tool for use in the technical and artistic assessment and manipulation of video images for cinema and television. Strangely enough, until this year, no acceptable technology to replace the “Grade 1” CRT had been released by any manufacturer. We were all left with the growing problem of keeping our aging “Grade 1” CRT displays working as accurately as possible. 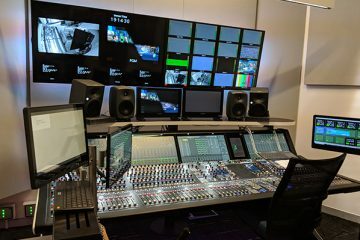 Video engineers, colourists and editors had to rely on making critical production decisions based on either the aging fleet of existing CRT monitors, or on various attempts to use domestic LCD monitors in a professional context. The older CRTs suffered a loss of performance and consistency, and the LCDs adhered to no standards in particular. The CRTs could not meet the REC-709 values for gamut or white point, and as they aged could no longer produce the 100Nits of light output without premature aging. LCDs won’t cut off in blacks (stayed dark grey) and tended to clamp (to black) the darker parts of the picture. Plasma displays also have poor black detail, and tend to limit the overall Average Picture Level across the whole display (so the bright areas in an overall bright scene will be inaccurately reproduced darker than the same bright areas in an overall dark scene). Many television operators just gave up on assessing their pictures altogether, and built new multi-channel content aggregation facilities with nowhere to look critically at the pictures being served up. This helped reduce television productions to being mere data content to be bought, sold, ingested, encoded and played out. In this business model, nobody was “keeping their eye on the ball”, rather like American car companies whose management forgot how to actually make cars. On the other hand, the film industry was a lot smarter, and the growth of capacity and activity in DI (Digital Intermediate) for post production, meant that there was an expectation for increasingly close attention to the “look” of pictures by colourists, animators and DOPs. Looking at the problem from another angle, we really have to ask ourselves why we are still using monitors built from gigantic ancient vacuum tube technology, heavy and bulky to handle and install, and dangerous to service. Even when new, and despite clever electronic compensation circuitry, the performance is still prone to drift from aging, magnetic fields, temperature variations, high operating temperatures and varying ambient light levels. Try finding anyone who can still remember how to line up a CRT monitor at all precisely. A situation that’s hardly appropriate to today’s exacting world of precisely quantified digital television and the aesthetic demands of colourists! Doesn’t rely for its existence on a consumer manufacturing system to supply CRTs. Has sufficient calibration in-factory, and later in-field, to meet professional requirements of stability in time and between other precision monitors, and maintain such over the life of the device. Offers picture reproduction as might consistently and usefully relate to that of the viewing circumstances of viewers out in the cinemas and at home. Has sufficient and consistent luminous output to conform to the viewing brightness criteria for both TV and cinema. Has some kind of useful co-dependency with the consumer manufacturing industry. (Business models include producing precision monitors as the high end of a mass production process for the consumer market, or conversely, developing patented methods of making high-performance monitors, that could later be licensed into the consumer manufacturing industry). Back in May our Section enjoyed the opportunity to inspect Sony’s offering in this area of need, an O-LED monitor, available both as a Grade 1 device and a cheaper “Pro” version. The Sony technology relies on a directly viewed panel array of 1920×1080 OLEDS. It does not suffer from most of the limitations of LCD and CRT displays. It left the comparison CRT and LCD devices for dead. The pricing and its form factor made it immediately adoptable for use in the TV industry. What does the name “Dolby” make you think of? And then there was the actual Ray Dolby, founder of the company Dolby Laboratories, seen here as a member of the team which produced the first viable VTR (the Ampex quadruplex machine). Ray did this work as an undergraduate, after personally impressing Alex Poniatoff. He started Dolby Labs in the UK in 1965. This photo is so old that they apparently hadn’t even invented the pocket protector. The company relocated to the USA in 1976, and the rest is history, which you can read up on in Wikipedia at http://en.wikipedia.org/wiki/Dolby_Laboratories. Ray Dolby became a member of the Forbes 400, with an estimated net worth of $2.7 billion in 2008. Dolby Labs is an enormously successful engineering and corporate phenomenon that is worthy of our study and admiration in its own right, because it took useful engineering achievements and applied them to develop and commercially market both equipment and pure technology patents. Their achievements greatly advanced our industry, and demonstrated a business model for ROI on research, as subsequently adopted by the various developers and patent-holders of the several forms of MPEG video compression. In the present instance, Dolby has effectively returned some of this capability, by having the wherewithal to fund and develop the Dolby PRM video monitor. The evening kicked off with the pleasant customary SMPTE prelude of drinkies, supper and socialising, including meeting the two Dolby representatives Chris Combs and Michael Reeves. After a modicum of soclialising, we proceeded to Soundfirm’s mix theatre, where the Dolby monitor was set up beside two carefully aligned traditional monitors; a Sony 24inch TriMaster LCD and a Sony BVM-D series 24” grade 1 CRT. The following observations and comments in this article are for general interest reading and backgrounding. They are drawn in the large part from what we saw in the demonstration, what the presenters told us, and what attendees commented upon. It’s by no means a critical or comparative review of the product and we haven’t independently tested what we heard. Whilst our Industry is developed and driven by commercial processes, it’s not SMPTE’s role to proselytise particular products or brands, so this article should be read and interpreted accordingly as an attempt to reproduce the discourse that took place amongst participants at our Technology Evening. If you’re about to make a business decision in this area, please be a good technologist and do your own more-thorough research and make your own decisions! The PRM-4200 is a 42 inch flat panel display, with a native 1920×1080 display, ideally sized for cinema post production suites. At IBC in Amsterdam this month a prototype 24inch was reportedly being shown for the first time. The technology relies on “Dolby Dual Modulation” with a display built as a sandwich of two layers of display. BACK LAYER: a flat panel of over 1500 per primary RGB LEDs, modulated to produce a low resolution monochrome back-light image, but with high output and dynamic range. LCD LAYER: A 1920×1080 LCD panel, to provide hue and detail, whose dynamic range is vastly enhanced by the variable LED light source behind it. As LCD panels don’t quite entirely shut off in blacks, the LEDs assist by going totally dark for the black parts of the picture, rendering black blacks. Likewise, shadowy areas just above black can be made to reveal picture information totally concealed on an LCD and, surprisingly, scarcely visible on the CRT. Obviously, there’s some pretty smart processing going on to make the layers work together with great precision. We were shown a series of short test movies on HD video, viewed simultaneously on all three monitors. Significantly, these mini-movies were significantly all created by “proper” film makers, including three by Bill Bennett, with creative integrity and clear aesthetic objectives of themselves, as well as being test pieces for the monitor. We were then shown some 2K 12-bit HDR stills material from the Academy, off a server, at a typical TV viewing brightness of 100 Nits, and then again at a blinding 600 Nits, being far brighter than any precision CRT could display. The blacks remained black and the greyscale and dynamic range were sustained. The display is limited to its native 1920×1080, which is fine for most picture assessment and grading work, and of course, ideal for HDTV. 2048×1080 film resolutions are handled by scaling or panning/cropping of signals fed to it as single or dual-link 3G capable SDI. The display’s colour space performance complies with the standards “P3,” “Rec709,” “EBU” and “C” from signals delivered in up to 12bit SD, HD and 3G modes. The CIE value for the primaries and white point can be adjusted in x’ and y’ co-ordinates via the supplied Control Surface to accurately match the required colour space. The Dolby monitor can be set up to display pictures with various levels of gamma correction, such as 2.2, 2.4 and 2.6, to match the amount of gamma correction built into the signals being delivered to it for display. Gerry Brooks asked rhetorically whether, given that the TV industry’s traditional use of 2.2 gamma in cameras and graphics sources was to offset the inherent but undesirable gamma characteristics of the once-ubiquitous CRT displays, maybe it’s time to dispense with source gamma manipulation altogether? Whilst it would be very non-standard at present, it would solve dark noise problems resulting from today’s gamma manipulations, and would certainly be optimal for the new generation of displays. Viewing angle limitations have been a “major fail” with earlier LCD displays. The PRM-4200 is designed to be usefully viewed from horizontal viewing angles up to +/- 45 degrees from axis. Its vertical viewing angles are +/- 25 degrees, but high vertical viewing angles are a lot less common in real life. We were able to try these out in the demonstration. The CRT display was shown to have excessive internal flaring. That’s when a white object is displayed on a very dark background, and the monitor adds a false “glow” around the bright object, that wasn’t created in the camera. This is due to light from the brightly lit phosphors in the CRT surface, being conducted internally into the dark areas. It’s something that old hands have become used to and must have compensated for mentally. How long does it take for the PRM from receiving the incoming signal to displaying it? Digital TV devices need time to do the processing that makes them work so well. They have to store each frame of image, perform clever mathematical processing on it, then reconstitute it and spit it out to the display for us to see. This wait is generally ”well worth the time it takes” but for live production, you only see your work after it’s happened, and live switching can get very out of step with the action being covered. The PRM is rated at a two frame delay. To assist with keeping the vision and sound monitoring synchronised, the PRM is able to “report” to an external audio delay device to automatically achieve appropriate audio delay. On Location: for “viewfinding”, perhaps mounted in a small van. Screening of Dailies: Now an “instant” process, and also nowadays the first step in the colourist’s workflow. Colour grading; including the restoration of older movies for re-release. The Dolby guys explained how their monitor is so stable that their CRT comparison monitor appears to continually drift in its levels and colour balance during a viewing session, but in the old days, without a stable comparison like the Dolby monitor, our perception used not to notice it. They also reported that the monitor’s initial factory alignment holds up quite well after transportation and field use. The sample unit measured a negligible drift of less than 5 parts in 10,000 (in x’y’ output levels) after shipping from Melbourne to Sydney on its tour of Australia. They have a full field alignment procedure as required for supporting the monitor during its service life in the field. Users also report favourably on the consistency of viewing experience when their material is viewed at different Dolby-equipped monitoring facilities across the industry. Service life for the LCD panel is rated at 50,000 operating hours, and sections of the LED can be replaced if faults develop. Users can carry a USB memory stick with them as they and their content go from facility to facility, with their up to 10 favourite presets for the PRM-4200, to keep their viewing experience consistent for their current project. Individual pixel coordinates in the displayed image can be located and sampled and their values measured. This would be very useful for engineers in tracing performance issues in the pictures and the handling thereof, and useful for creative work in understanding how the images are actually composed. This composited, tweaked and generally unscientific snap-shot, attempts to show the result of displaying a grey scale on the CRT (left), the LCD (centre) and the PRM (right). The internal flaring on the CRT is visible on the white chip. The black background shows as dark grey on the LCD, and the PRM is better than either in these respects. The Dolby guys said that even after they had colour-balanced all three monitors correctly, the CRT always looked less greenish than the PRM. This is due, they said, to the different spectral spread of the primary colours used in the phosphors versus the LCD dyes. Future models may include smaller sizes for field production and for television studios. A 24” version is apparently “real soon now”. Stereo 3D is hopefully to be supported at some time in the future, but not a definite just yet. Stay tuned for more informative events like this, planned as one per month. For non-Sydney based people, we intend to offer events in other cities, and we are working towards delivery of content and participation via webcasting, and later on, by video on demand. If you’re interested in helping with this, contact us.